Migratory zooplankton, such as copepods experience widely varying conditions in their physicochemical environment on a diurnal basis. The amplitude of the fluctuations may affect the copepods’ ability to respond to climate change. The environment in coastal areas is naturally fluctuating and the effects of ocean acidification are difficult to predict. Negative effects on copepods may affect the whole food web as they are the most abundant zooplankton, constituting a major part of the diet of fish. In this study, we determined the vertical profiles of an array of environmental variables and the vertical distribution of common copepods in a shallow coastal area of the Baltic Sea. We sampled once a month, in June, July and August, every sixth hour during 24 h. We found that copepods experience a change in pH of more than 0.5 units and 5 °C change in temperature during migration. Thus, on diurnal time scales copepods experience a range in their physicochemical environment that is equal to or larger than the predicted climate change scenarios. A mesocosm experiment was conducted to investigate the impact of rising fCO2 on the build-up and decline of organic matter during coastal phytoplankton blooms. Five mesocosms (∼38 m³ each) were deployed in the Baltic Sea during spring (2009) and enriched with CO2 to yield a gradient of 355–862 µatm. Mesocosms were nutrient fertilized initially to induce phytoplankton bloom development. Changes in particulate and dissolved organic matter concentrations, including dissolved high-molecular weight (>1 kDa) combined carbohydrates, dissolved free and combined amino acids as well as transparent exopolymer particles (TEP), were monitored over 21 days together with bacterial abundance, and hydrolytic extracellular enzyme activities. Overall, organic matter followed well-known bloom dynamics in all CO2 treatments alike. At high fCO2, higher ΔPOC:ΔPON during bloom rise, and higher TEP concentrations during bloom peak, suggested preferential accumulation of carbon-rich components. TEP concentration at bloom peak was significantly related to subsequent sedimentation of particulate organic matter. Bacterial abundance increased during the bloom and was highest at high fCO2. We conclude that increasing fCO2 supports production and exudation of carbon-rich components, enhancing particle aggregation and settling, but also providing substrate and attachment sites for bacteria. More labile organic carbon and higher bacterial abundance can increase rates of oxygen consumption and may intensify the already high risk of oxygen depletion in coastal seas in the future. Zooplankton are an important link between primary producers and fish. Therefore, it is crucial to address their responses when predicting effects of climate change on pelagic ecosystems. For realistic community-level predictions, several biotic and abiotic climate-related variables should be examined in combination. We studied the combined effects of ocean acidification and global warming predicted for year 2100 with toxic cyanobacteria on the calanoid copepod, Acartia bifilosa. Acidification together with higher temperature reduced copepod antioxidant capacity. Higher temperature also decreased egg viability, nauplii development, and oxidative status. Exposure to cyanobacteria and its toxin had a negative effect on egg production but, a positive effect on oxidative status and egg viability, giving no net effects on viable egg production. Additionally, nauplii development was enhanced by the presence of cyanobacteria, which partially alleviated the otherwise negative effects of increased temperature and decreased pH on the copepod recruitment. The interactive effects of temperature, acidification, and cyanobacteria on copepods highlight the importance of testing combined effects of climate-related factors when predicting biological responses. Oceans are capable of storing part of the emitted anthropogenic carbon dioxide (CO2) due to the formation of carbonic acid and subsequent dissociation. CO2 is also assimilated by biota and the inorganic carbon system is thus coupled to biogeochemical processes. Naturally, it is a substantial improvement of model realism if the inorganic carbon system is fully coupled to biogeochemistry in numerical models. The focus of this thesis has been to improve the accuracy of pH and the partial pressure of CO2 (pCO2) computations for a marine environment like the Baltic Sea, but the knowledge we have gained is generally applicable. 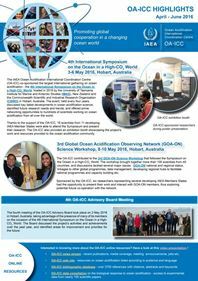 A model system has been developed to consider several environmental threats simultaneously (eutrophication, acidification, and climate change) and the model skill has been certified by using objective skill metrics. To improve the coupling between biogeochemical processes and the dissolved inorganic carbon system, generation and depletion of total alkalinity (AT) due to several biogeochemical reactions was added to the model. In situ generation of AT was found to be important, specifically in regions with permanent or periodic anoxia, as the major AT changes were coupled to oxidation–reduction (redox) reactions. Without adding AT from these processes, the correct pH could not be calculated in anoxic waters and the mean volume AT content was found to be too low. The improvements were put to use when several environmental threats were evaluated simultaneously in a study of possible future changes in the Baltic Sea pH and oxygen balances. A coupled model for the catchment and sea was set up and forced by meteorological and hydrological datasets and scenarios. The results showed that increased nutrient loads will not inhibit future Baltic Sea acidification, but the seasonal pH cycle will be amplified by increased biological production and mineralization. The study indicated future acidification of the whole Baltic Sea and that the main factor controlling the direction and magnitude of the change was the atmospheric CO2 concentration. Through a previous investigation of the sensitivity of Baltic Sea surface water pH it was found that increased atmospheric CO2 can affect pH also through changing the river chemistry, especially with regard to AT. The latter could severely impact water in the northern Baltic region. To improve modelled seasonal pCO2 variations dissolved organic matter was added to a numerical model. The modelled phytoplankton were allowed to utilize the dissolved organic nutrients and the biological drawdown of CO2 in the Eastern Gotland basin was much improved by this. When phytoplankton used the organic nutrients the CO2 assimilation was higher during the summer months and the partial pressure of CO2 decreased by ~200 µatm in the Eastern Gotland Basin as a result. In the Bothnian Bay, both the duration and magnitude of CO2 assimilation was doubled when phytoplankton utilized dissolved organic nutrients. 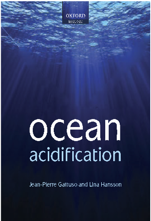 Acidification of the World’s oceans may directly impact reproduction, performance and shell formation of marine calcifying organisms. In addition, since shell production is costly and stress in general draws on an organism’s energy budget, shell growth and stability of bivalves should indirectly be affected by environmental stress. The aim of this study was to investigate whether a combination of warming and acidification leads to increased physiological stress (lipofuscin accumulation and mortality) and affects the performance [shell growth, shell breaking force, condition index (Ci)] of young Mytilus edulis and Arctica islandica from the Baltic Sea. We cultured the bivalves in a fully-crossed 2-factorial experimental setup (seawater (sw) pCO2 levels “low”, “medium” and “high” for both species, temperature levels 7.5, 10, 16, 20 and 25 °C for M. edulis and 7.5, 10 and 16 °C for A. islandica) for 13 weeks in summer. Mytilus edulis and A. islandica appeared to tolerate wide ranges of sw temperature and pCO2. Lipofuscin accumulation of M. edulis increased with temperature while the Ci decreased, but shell growth of the mussels only sharply decreased while its mortality increased between 20 and 25 °C. In A. islandica, lipofuscin accumulation increased with temperature, whereas the Ci, shell growth and shell breaking force decreased. The pCO2 treatment had only marginal effects on the measured parameters of both bivalve species. Shell growth of both bivalve species was not impaired by under-saturation of the sea water with respect to aragonite and calcite. Furthermore, independently of water temperatures shell breaking force of both species and shell growth of A. islandica remained unaffected by the applied elevated sw pCO2 for several months. Only at the highest temperature (25 °C), growth arrest of M. edulis was recorded at the high sw pCO2 treatment and the Ci of M. edulis was slightly higher at the medium sw pCO2 treatment than at the low and high sw pCO2 treatments. The only effect of elevated sw pCO2 on A. islandica was an increase in lipofuscin accumulation at the high sw pCO2 treatment compared to the medium sw pCO2 treatment. Our results show that, despite this robustness, growth of both M. edulis and A. islandica can be reduced if sw temperatures remain high for several weeks in summer. As large body size constitutes an escape from crab and sea star predation, this can make bivalves presumably more vulnerable to predation—with possible negative consequences on population growth. In M. edulis, but not in A. islandica, this effect is amplified by elevated sw pCO2. We follow that combined effects of elevated sw pCO2 and ocean warming might cause shifts in future Western Baltic Sea community structures and ecosystem services; however, only if predators or other interacting species do not suffer as strong from these stressors.